"A great Week In The Northern Forest!" 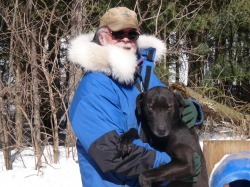 It was a fun week here running dogs & enjoying one of Quebec's great traditions. As in every year at the end of the season, we all go to enjoy the Quebec Spring Ritual:" La Cabane a Sucre ". This feast takes place at maple syrup farm were we indulged in a meal consisting of: Pea Soup, Baked Beans, Fresh Baked Bread, Creton,Scrambled Eggs, Bacon, Ham, Potatoes, Crispy Pork Rhine, Tomato Relish,Home Made Pickles, Pickled Beets, Poached Egg in Maple Syrup, Fresh Fritters and of coarse an ample supply of Maple Syrup. This week Julia, Cecile & Lila ran teams of six dogs. I also trained the two groups of puppies & the "A" Team of 12 dogs. The video above is of the 7 month old puppies on their second run in a team.